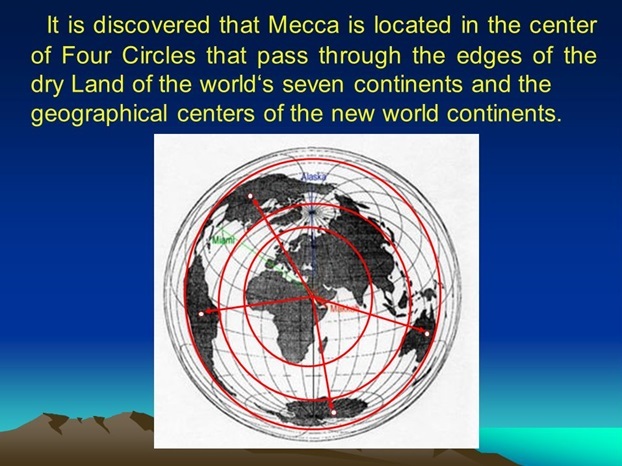 Here we bring to bear discoveries about our physical world, about the pattern of forces at work on the surface of our earth and throughout the planet, as related to the geographical location of Makkah/ the Kâ’bah. As residents of the modern, science & technology-dominated world, we here suggest physical sources for subtle, beneficial effects on the human body, intrinsic to performing Ṭawwaf as a form of worship in the precise location of Makkah. Spiritual health and physical health are meant to complement one another. 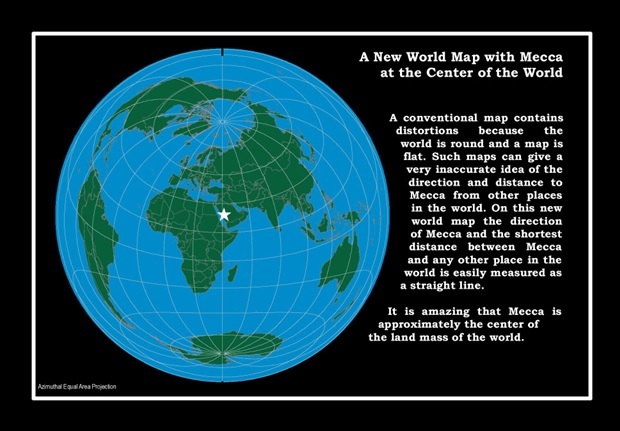 This notion of physical benefits resulting from the performance of Ṭawwaf has arisen from the observation that the Kâ’bah can be viewed as the geographical centre point of the world’s land mass. Does this location suggest that the centre point of the earth’s land mass has unique, measurable characteristics? Maybe. But that is not all. Secondly, it is said to have been reported that a significant level of short-wave energy rises from the earth, as detected by measurements taken during a space mission. According to a controversial interview on the MEMRI TV Project, this radiation of short-waves was reportedly emanating from the geographical location of the Ka’bah[i] and registered from a position straight upward in the earth’s atmosphere. From the point of view of Science, we would want, of course, a thorough study of this claim. We know that the earth’s North and South Poles roughly coincide with the ends of the axis around which the earth revolves. 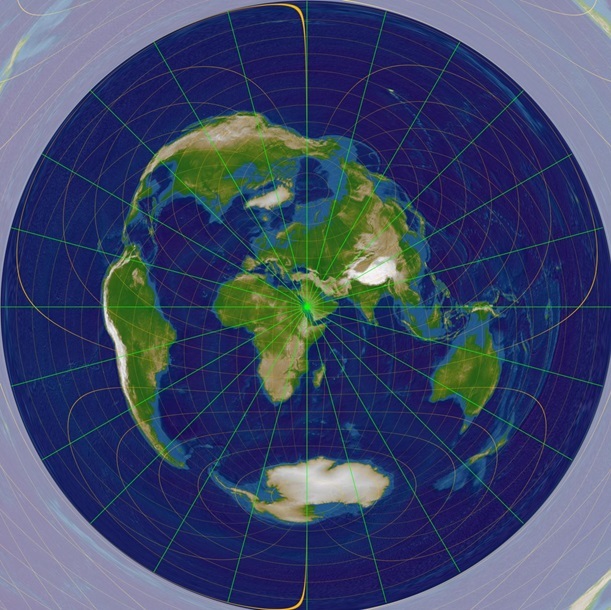 A bi-polar magnetic field exists along this North-South axis; in fact, this same bi-polar magnetic field can be demonstrated in iron bar magnets anywhere on earth. But are there other planet-wide systems of electromagnetic energy —or other, as yet unexamined, perhaps even un-named, forms of energy— which can impact the well-being of life on the earth’s surface, more so at certain points than at other points? Is Ṭawwaf a ‘technique’ somehow congruent with the very physical nature of the Creation, specifically with that of our home planet and its centre of geographical dry land mass? 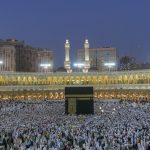 Is Ṭawwaf a technique for tapping into, or magnifying the spiritual blessing held out to us from Allah, deriving from a Hajj experience at the Ka’bah? Does the performance of Ṭawwaf serve to open up one’s sensitivity of nearness to Allah? And for that matter, similarly, is the mandated ‘procedure’ of Ṣalat another format for more readily aligning oneself —at any place on earth—into renewed submission to the Creator? Possibly. What is, for sure, given to us in Islam is practical guidance on the Straight Path. Ṭawwaf and Ṣalat are two ancient ritual forms of worship[ii] purified from idolatry and re-established from time immemorial through Prophet Muhammad (ﷺ) for the benefit of mankind. We are told that Adam established the first place of worship on earth. We also know that the structure standing at the centre of worship on the site of the present-day Kâ’bah has been rebuilt[iii] repeatedly, notably by ‘Ibrâhîm and Ismâ’îl (Surat al-Baqarah, 2:127). In time, Makkah would become an ideal location as a trading centre since it was considered a ‘holy’ place, a safe haven from fighting. But by pre-Islamic times, the practice of Ṭawwaf around the Kâ’bah had been grossly corrupted[iv] with pagan perversions of the ritual. Just as Prophet Muhammad cleansed the House of the Kâ’bah of its pagan idols, so also he purified and re-instituted the rites of Hajj, which included the seven circuits of Ṭawwaf. Why the Kâ’bah location and why Ṭawwaf? What is meant by the statement that the Kâ’bah is at the centre of the world’s surface? Why does one need to perform the circumambulations in an anti-clockwise direction? Why seven circumambulations to every Ṭawwaf? Why perform Ṭawwaf in as many repetitions as one is able? When these questions were asked to Islamic scholars and ‘Ulama (Certified Scholars) they gave replies from the angle of Shari’ah but they could not provide answers in a scientifically satisfactory way. Our purpose here is to try to lessen those gaps using our current knowledge of the physical world so as to satisfy the sensibilities of modern man. As presented earlier in this article, the geographical center of the earth’s dry surface land mass can be pin-pointed to the location where the present-day Kâ’bah now stands. The blessings which Allah accordingly associates with his prophets. 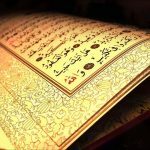 The above ayah 3:96, specifying Bakkah as “the Blessed,” indicates that Allah had already chosen or created this world-central site to become a source of divine guidance for all peoples, provided through the descendants of Ibrâhîm. [ii] In the Biblical book of Genesis, chapter 28, we find the story of how Jacob (Ya’kûb) obeyed his father, Isaac (Ishâq), in returning to the ancestral homeland of his grandfather Abraham (Ibrâhîm) to marry his maternal cousin. Thereupon, Jacob’s brother, Esau [in keeping with his father’s disapproval for him to marry a local girl in Palestine], went to his is paternal uncle Ishmael (Ismâ’îl) —in what would have been Arabia— to marry Ismâ’îl’s daughter, his cousin. Thus the descendants of Ibrâhîm’s two sons Ismâ’îl and Ishâq intermarried with each other, even though they had been separated geographically due to the jealousy of Ishâq’s mother. We do not know from the Bible how much interaction the two half-brothers had with each other after their initial separation —only that at the death of their father, they joined together to bury him. What the Biblical narrative indicates for our purposes is that Ismâ’îl’s brother, too, established his own “house of God,” a place dedicated to worship for Banî Isrâ’îl and the giving of a proportion of his possessions [i.e., zakat]. This was before the building of the Temple in Jerusalem.